Puuurfect. Petrageous Designs carries a line of “functional, whimsical and outrageous pet products.” We took several of them for a test run and we are impressed. Take for example their line of handcrafted cat and dog dishes. 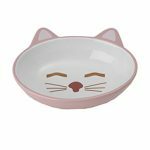 The Sleepy Kitty oval pink cat dish shown here is easy to fill. The oval shape accommodates our kitty’s whiskers with no problem. The dish is hand-crafted and oven-fired. It’s fully compliant with FDA regulations & standards for human consumption. It easily wipes clean but it’s also dishwasher and microwave safe. Visit Petrageous Designs.